The Woolly Sedge is a more extensive perennial sedge with fibrous roots that is the perfect plant to combat soil erosion. It grows thick and pretty with thick light green leaves and a sheath that is purple, pink or red. The plant's leaves darken as late summer arrives, and small bright green to light yellow staminate flowers emerge. This sedge grows beautifully in moist or wet conditions, although it adapts well to drier conditions too. It loves the sun and is hardy. It also spreads quickly making it a natural plant to cultivate for ground cover. The Woolly Sedge will attract butterflies, wetland birds, various types of waterfowl, rails and geese, so is a favorite with wildlife enthusiasts. Woolly Sedge is a native wetland grass that appears every year and then disappears later in the fall. Woolly sedge reproduces by underground rhizomes that spread forming large colonies and through seeds. Woolly Sedge can adapt to any area as long as it stays moist enough to support the grass. This grass can be found growing on the occasional wetlands in the eastern United States where they can get moisture. Wooly Sedge’s sedges are a food source for some birds but are not commonly consumed by other animals as it is low in proteins. Woolly sedge is a very important native grass that provides many things other than just beauty. Woolly Sedge is a food source for many birds and is also used as cover to protect them from predators. Woolly sedge is also used by birds to help in the nest building process so they can lay their eggs. This grass is also consumed by large game birds and deer, while many small rodents eat the seeds. 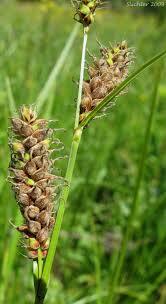 This sedge also helps prevent soil erosion with its thick fibrous roots. Woolly Sedge even grows in extremely shallow levels of water, less than an inch. The Woolly sedge has long slender green leaves that are grown crisscrossing each other the more mature the plant gets. The plant starts out as a dark green but will turn to a lighter green and then a dark brown once the fallen has fallen. They are best to plant in late spring to early summer. This sedge grows in most states east of the Mississippi River.